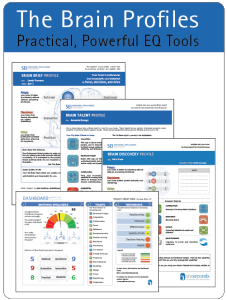 Earn your Brain Profiler Certification to effectively apply the EQ Brain profiles. The Brain Profiles include the Brain Brief Profile, Brain Talent Profile, Brain Discovery Profile — and the Dashboard. These are remarkable tools because the provide a simple, powerful way to bring EQ into the action yielding increased insight, collaboration, and engagement. In this training, you’ll learn to implement, interpret and apply these tools. They can be utilized to improve performance, selection, team collaboration, and customer orientation — and in any training / teaching context to quickly add a focus on emotional intelligence.